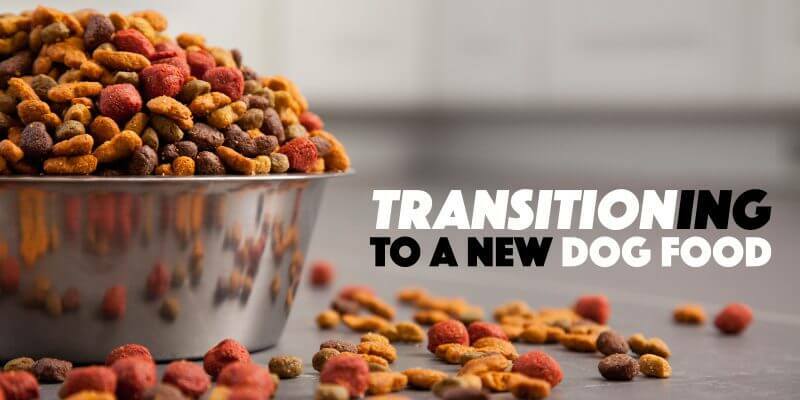 Why Transitioning to a New Dog Food? Pets make difficult patients. Your dog cannot pinpoint the cause of his internal discomfort, much less make it clear to you. He cannot even tell you if he’s gained weight. However, just like humans, they can suffer from a great number of diseases that can affect their quality of life directly. 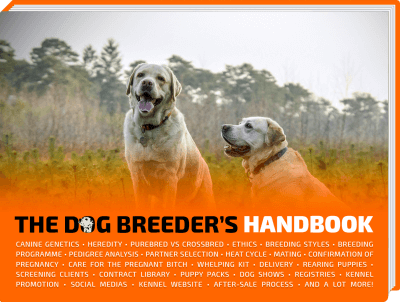 As the owner, it is up to you to decipher what might be wrong with your dog. The solution to those problems is also your decision. This great responsibility for another living being cannot be taken lightly, and the value placed on it by each dog owner is evident through the food that he or she feeds the pet. Because dog owners and dog breeders worldwide are understanding better their dog’s nutritional needs, we are seeing millions of dog owners transitioning to a new dog food for their pets. 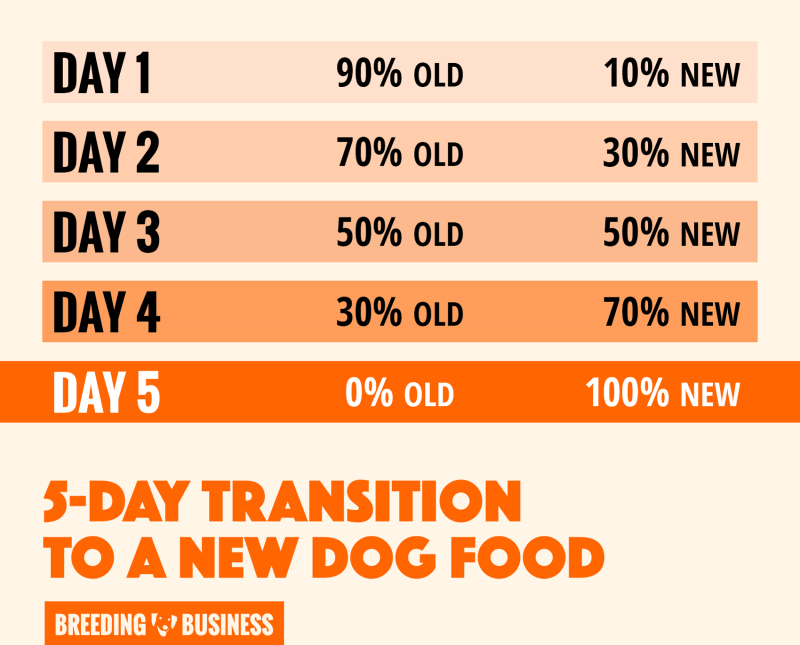 This is great news but the dog food transition has to be gradual to avoid upset stomachs. Many diseases and conditions that might affect your dog’s health can either be traced back to nutrition or can be improved by it. Obesity ranks first among them, and it is extremely widespread in the United States, with approximately half of the entire American dog population suffering from it. Obesity in itself is dangerous as it weakens the organism and makes it vulnerable to other health issues such as dog arthritis, diabetes, high blood pressure – and therefore heart failure – or even cancer. Some breeds, such as Saint Bernards or Beagles, have a predisposition to obesity. The other main reason is the food portions and quality given by the owner. Largely ignored or not recognized, obesity in a dog can affect him for years. 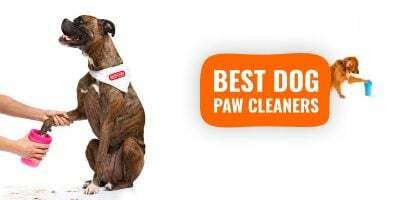 However, it can be easily identified, even by the pet owner. As a general rule, if you are unable to immediately locate the rib cage due to the layer of fat covering the bones, the dog is overweight. The condition is serious as it can severely decrease pet life expectancy. 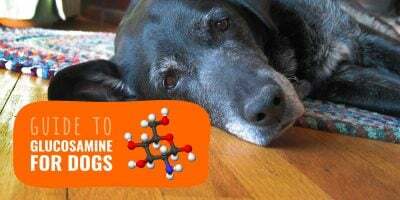 Pancreatitis is another disease that is all too common in dogs, and it is also connected to the overabundance of fat in your pet’s diet. Similarly, bladder stones, heart diseases or diarrhea can all be traced back to the eating habits of your dog. These are your responsibility, and switching to a healthy diet is the sensible course of action for the sake of your dog’s health. A diet that balances the calorie and fat intake of your dog is the first measure that should be taken against pet obesity. There are many healthy dog food options available on the market, that will not only lower the body fat of your dog, but also improve his quality of life, toughen its immune system, and prolong its life. Pancreatitis can as well be treated with a diet that is low in fat and easily digestible. Similarly, depending on severity, bladder stones can either be removed through surgery or dissolved with food rich in calcium oxalates. Heart disease can be explained by high blood pressure, something that is connected to your pet being given table scraps and other foods that are high in sodium. Finally, the pains of diarrhea can greatly be alleviated and even cured through diet. While a high fiber diet helps large bowel diarrhea, a bland and low-fat food intake helps with small bowel diarrhea. 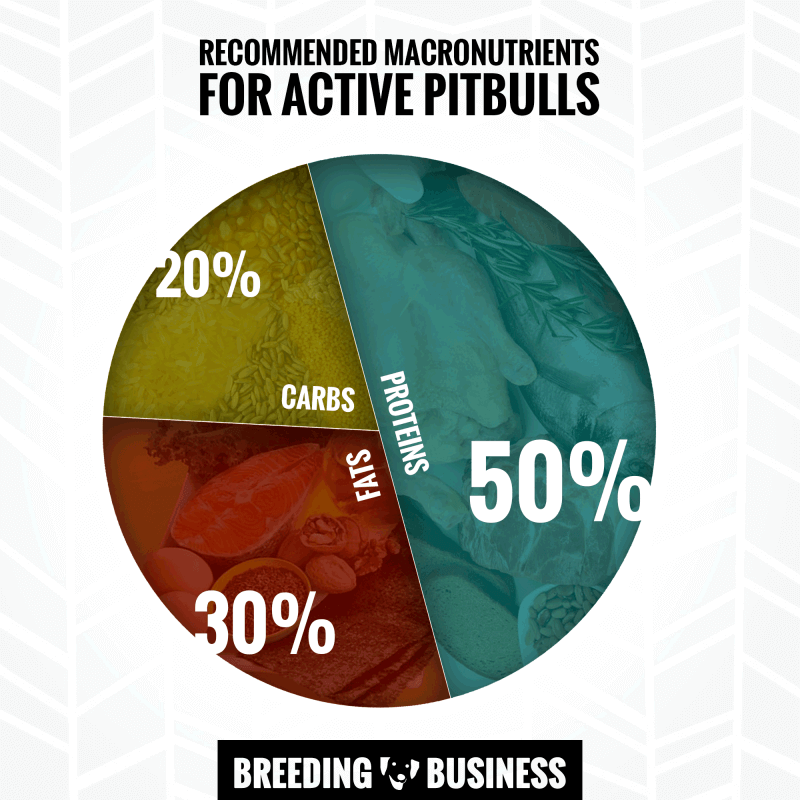 The macronutrient ratio we recommend for pitbulls and active working dogs: 50% of proteins, 30% of fats and 20% of carbohydrates. There is no single food that fulfills all the dietary needs of dogs. Feeding him the same thing day in and day out in order to impose a kind of diet stability is therefore wrong, especially if processed foods are used. Similarly, excessive supplementation can be harmful to the pet. A complete and balanced diet, meaning one that provides all the nutritional needs of pets, can be entirely reached through homemade foods. This way, you can control the cycle of meat, raw meat, vegetables and other foods. If you cannot possibly find the time to cook varied, homemade food for your dog, attentively reading dog food labels becomes paramount. The primary indicator that separates good from bad quality dog food is the main ingredient. As a rule, dog foods that are based on corn or grains are less beneficial than the ones with meat as first ingredient. For healthy dogs, the protein content should be at least 30%, the fat at 18%, both necessarily coupled with vitamins such as E, C and Omega Fatty Acids. If the food suggests a supplement to go along with each meal, then the food itself is of poor quality. Food coloring should also be avoided. The first measure taken to counter the dangers of obesity or to safeguard your dog from it is portion control, even for the healthier homemade dog foods. 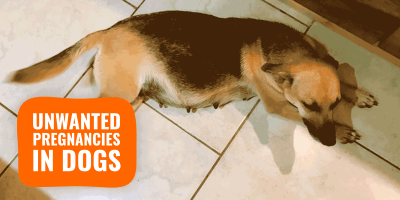 Overfeeding the dog is something a lot of pet owners are guilty of. 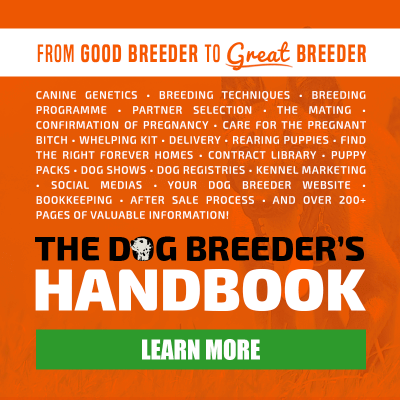 While dog food producers often include charts and recommendations on their products or websites, a professional veterinarian will know exactly how much and how often you should feed your dog. Controlling your dog’s intake of food might sound easy, but it can take a while to accomplish. This is because usually, you are not the only one who feeds him. Other members of the family, impressed by the dog’s persistent gaze, can slip him a bone or some meat from the table, countering your dietary efforts. Treats are often the reason why dogs gain weight despite their relatively healthy and varied main meals. Replacing meat and bones with veggies or rice cakes can, therefore, go a long way in cutting down on weight and improving your dog’s health. It might not seem like it, but the canine digestive system is more sensitive than that of humans. Major changes in your dog’s diet, although intended to help him over time, can be damaging if done suddenly. One dietary transition that every pet goes through happens once they pass into maturity. As adults, however, another change of that magnitude is demanding to their organism. For that reason, the gradual approach is necessary, commonly over the course of five to ten days. Start by changing around 10-20% of your dog’s menu with the new food. Do so for a few days, before upping the percentage to 50%. It is important to keep the same feeding times as before and to enhance the appeal of every meal by hand feeding the dog the first few bites. Around this middle period, some dogs start having a hard time finishing their portions. Depending on the dog’s reaction, you can either switch back to around 25% or go higher. It is also important to consult a veterinarian if problems persist. After a week, you should be able to feed your dog a whole portion of new food without concern. Just like in humans, slimming down can seem painfully slow for dogs, despite major efforts. In a few months, however, you should start seeing visible changes in your pet’s weight. After a longer period of sustained diet, you will notice a renewed vigor and energy overcoming him. Lighter and in a better shape, your dog will once again race across the yard or through the rooms of the house. Frequent walks and low-fat foods for the dog’s benefit can demand a physical and financial effort from you. As the owner, however, it falls within your responsibility to decide and do what is best for your speechless companion. Once you see results, it is important to continue the diet, even if sometimes you give in to the begging stares yourself.